Did you know Microcerotermes are often misrepresented and classed as a non destructive Termite, but here at The Pest Company we know different. As Termite Inspectors we locate live termites often so we gain an understanding of the behaviours of certain termite species and we class Schedorhinotermes and Coptotermes the most destructive termites found in South East Qld. The Pest Company have found live Microcerotermes nests in roof voids and behind shower recess walls on many routine Termite Inspections. This is why we know it is essential to eradicate the nest before it’s too late. From here they work their way into homes and damage timbers. The Pest Company carry out Termite Inspections on a daily basis and find live Microcerotermes nests in trees (Arboreal Nests) and on the ground (Ground Mounds) that need to be eradicated. Leaving a live termite nest is asking for trouble. If you have located a Termite nest on your property, call us P: 1300552234. All subterranean Termite nests located near any property structures in South East Queensland should all be eradicated. 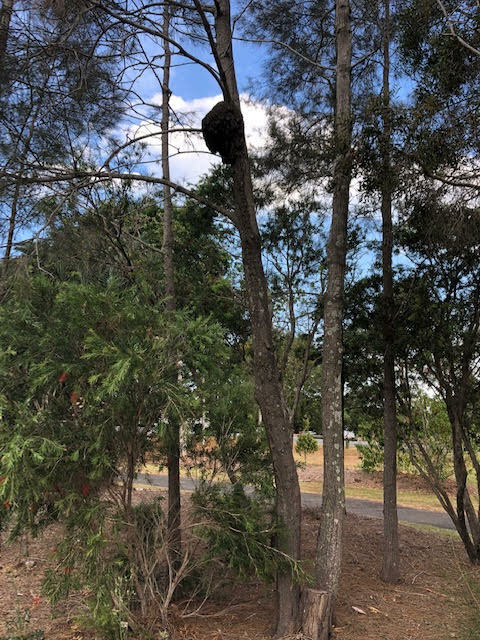 (Photo) Nest located in a local park in Robina Qld 4226.